Zack Snyder shoots down another Batman v Superman rumor. The new season of The X-Files will reveal the true nature of Dana Scully’s abductors. Star Wars: Episode VIII begins filming this month at a Force Awakens location. Plus, Candice Patton on Iris’ role in The Flash, and crazy Transformers 5 rumors. Spoilers! 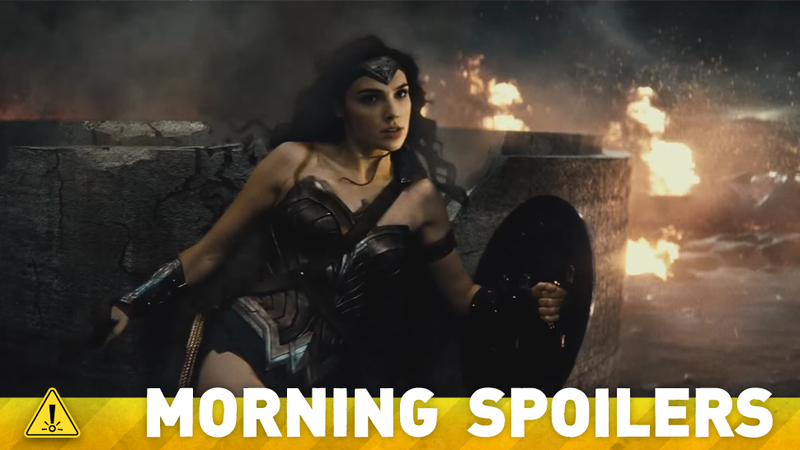 Prepare to lasso-of-truth the nearest pile of salt with this one, but Heroic Hollywood are reporting that the movie will allegedly be equally split between two time periods: the modern day, as well as the height of the Great War in the mid-to-late 1910s, presumably charting the first time Diana comes into contact with the world beyond Themyscira. There’s a rumor that my son is [playing] Robin. It’s not true. Now there are all these images of him that people have made where he’s dressed like Robin. It’s fun to hear and see them. An Entertainment Weekly article originally claiming that reshoots for The Force Awakens would take place Irish island of Skellig Michael this month caused Lucasfilm to reach out and the deny the report—instead confirmed that filming will take place at Skellig later this month, but for the upcoming Episode VIII instead. I really like this actress Gillian Jacobs, She’s known for all this comedy on ‘Community,’ and yet I didn’t know her from ‘Community’ first, I knew her from a movie called ‘Gardens of the Night,’ which is one of the most wrenching dramas, and she’s excellent. I thought, ‘I wonder if this great performer would do that again, would like to go there,’ and I think so. At the end of the day, I also knew Mike had my back, whether we were doing stunts together, or love-making scenes, which I’m not very comfortable with. Could she have been abducted by the government? That’s all I’m going to say. We might find out … in Season 10. Might. A little bit. Things like ‘Iris West: New STAR Labs leader’ and it’s just like oh, God [laughs]. No, she’s not going to be the new Wells of STAR Labs. She’s the one of the few people that can really talk to Barry and rally people when they need to be rallied. There’s a part early on in season two when she needs to do that...and get STAR Labs back in their footing. That’s kinda her role as a leader in that sense. I’m really happy because I like the direction they’ve gone with my character. I’m not the girlfriend or the love interest, I actually have my own storyline. I’m not just there to serve as a love interest. Yeah, I’m sure at some point, hopefully … not to be selfish on a personal level, they’ll cast someone to potentially be my love interest. It’ll probably happen and I like that I have my own storyline aside from Team Arrow as well; I have my own identity. Here’s a new piece of promo art for the upcoming season. Jim Gordon gets fired in this clip from “Damned If You Do”. Additional reporting by Gordon Jackson and Charlie Jane Anders. Top image: Batman v Superman.